this property is a charming two-story apartment located right on the Lake Maggiore. It sleeps three people. It is approximately 50 square meters (540 square feet). It features a shared swimming pool, direct access to the lake, a private terrace with a view of the lake, a shared garden, winter heating and WI-FI Internet access. this property is located on the second floor. You will reach it from the main entrance of the building by way of an elevator. For a succesful stay at this property we recommend having a car. You will be able to park it at approximately 200 meters (220 yards), for a fee, in a parking lot. Private parking must be reserved ahead of time; we kindly ask you to let our staff know, so that we can make the necessary arrangements for you. this property is one of the holiday homes available in a small complex. Please find a general description of the complex below, and please scroll further down for a description of this property. 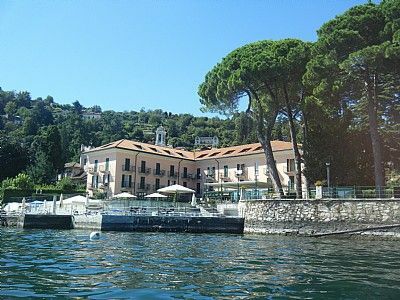 You&#39;ll be guests in an elegant villa right on the shore of Lake Maggiore, a few steps from the charming village of Meina. Here you&#39;ll find 28 apartments, all with views of the lake and with a patio, balcony or terrace. You&#39;ll have full use of the gracious communal garden as well as the spacious swimming pool, filled with lake water and clean white gravel depth. At the villa you&#39;ll find a reception desk open from 9:00 am til 12 noon and from 2:00 pm til 6:00 p.
The living room is paved with elegant wood. The furnishings are modern and welcoming. The furnishings include a divan bed for one guest. The dining table can accommodate three guests. In this room you will find a satellite television (local channels), a CD player with FM radio and an Ethernet plug for broadband Internet connection (don't forget your cable!). From the living room you will be able to enter a small terrace with a view of the lake through a French door. The bathroom is equipped with a washbasin, a toilet, a fully enclosed shower and a hairdryer. You will be able to enter the bathroom from the kitchen. This room has no door. The floor is paved with wood. The ceiling is sloped and has characteristic exposed wood beams. The room has a matrimonial bed (160 cm/62 inches, wider than a queen-size bed). From the bedroom you will be able to enter a terrace with a view of the lake through a French door. This bedroom has an en-suite bathroom, equipped with a washbasin, a toilet and a shower. This is a beautiful 1 bedroom property located in Piedmont, Italy. This villa, in Meina, boasts gorgeous sea and lake views sleeping 3 people. The villa offers superb accommodation, including modern luxuries such as a community pool, internet access, television and an open terrace.